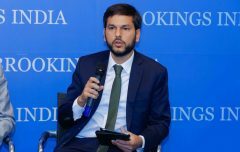 Dr. Constantino Xavier will present his research on how India is responding to China’s massive inroads into South Asia and the Indian Ocean region. The talk will focus on how the rise of China has pushed India to develop alternative policies that balance connectivity, security and democracy in its neighborhood. Delhi is now more willing to work with outside powers to enhance connectivity in what used to be its exclusive sphere of influence. Traditionally less vocal about the role of values in its foreign policy, India is now also more willing to engage in democracy assistance beyond its borders, mostly focused on capacity-building. These shifts also open opportunities for greater dialogue and cooperation with Japan, the United States, Canada and other “like-minded” democratic powers.